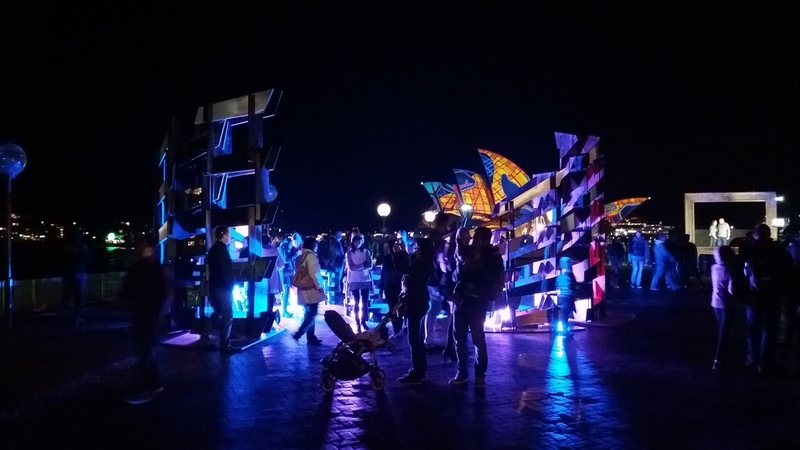 Sydney Vivid 2016 project collaboration with artist Rebekah Araullo. PTOLEMi is an architectural installation that swirls along the edge of Campbells Cove, an abstract representation of the cultural values and artistic practices of the ‘iGeneration’. The iGeneration is broadly defined as a generation born into the new millennium, defined by their technology and media use and their love of electronic communication. The ‘i’ not only refers to types of mobile technologies (iPhone, iPad, iTunes, Wii) but the fact that these technologies are individualised in the way they are used. Artists and architects are increasingly influenced by the practices and values of the iGeneration, engaging in what the artist refers to as ‘digital bricolage’, where work is constructed from the materials at hand. In the digital world this involves the inclusion of computerised elements that control physical entities, giving rise to new approaches to space, environment and form. PTOLEMi is highly innovative in its form, construction and digital content. Visitors enjoy immersive experiences, enabled by the use of embedded sensors and media platforms using sound, video and graphics. LED and interactive technology add dynamism to the otherwise static structure. The swirling pattern that forms the structure and surface of PTOLEMi was constructed and developed by computation and advanced engineering whilst utilising basic construction principles. Visually, the structure delivers a sense of both tension and compression, resembling opposing currents in a whirl of continuous motion – the artist’s metaphor for ubiquitous technology. Thank you, you will receive future updates from Sencity. Thank you for your interest in us. Our new website will be launched soon, stay tuned! Can't wait? Contact us now to set up a pilot program.